Win a Bit of Free Camera Accessory Swag! Here’s a flash, the verb, not the noun, outdoor photography contest for you. This very informal contest will have 5 winners. All you have to do is follow the simple steps outline on my Facebook page. Click through below to get to the page and to enter the contest! Since I first captured “The Rundle Diamond” back in 2012 this photograph and become a well sought after, and elusive composition. 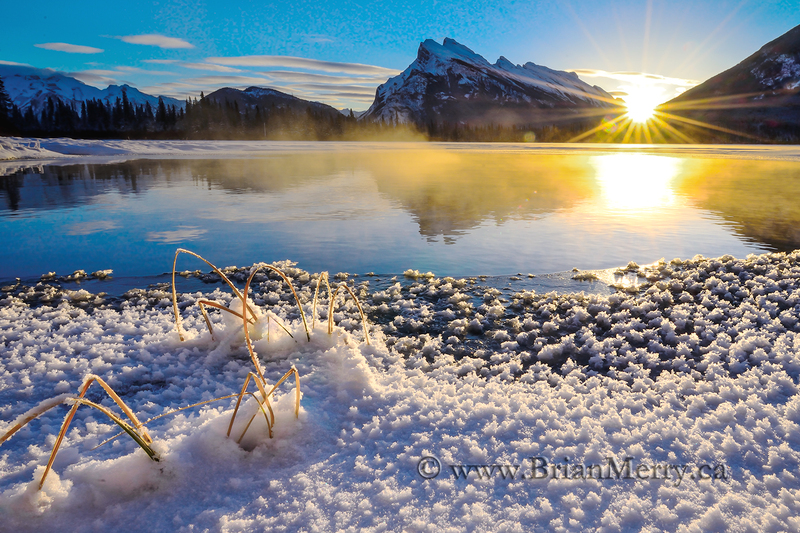 The Rundle Diamond is a popular landscape photograph that is on many serious landscape photographers’ hit list. It is an incredible composition. But, how do you capture this famous photograph? What is “The Rundle Diamond” anyway? That’s a good question, and I’ll fill you in here. The Rundle Diamond was a photograph that I captured on Boxing Day, Dec. 26, 2012. I briefly considered calling it Boxing Day, but quickly decided that “The Rundle Diamond” was a more colorfully descriptive name. Since mid-2013 that is what I started calling this composition. And, it’s caught on wildly throughout the landscape photography community. It’s also gained Worldwide appeal. How can I say this confidence? Each year when I’m not travelling somewhere in the World leading one of my travel photography tours that I host either on a solo photography trip, or leading one of my travel photography tours around the World I’ll try to capture a better version of The Rundle Diamond. Most of the time when I’m out there I bump into a half a dozen or more photographs there to capture the Rundle Diamond. The number of photographers travelling from all over the World that I see at Vermillion Lakes each year trying to capture this photograph has been steadily increasing over the years. This is why I think that this composition is gaining World wide appeal. 1/ You need open water that reflects Mount Rundle and Sulphur Mountain. 2/ The Sun needs to be rising in the bottom of the V shaped valley formed between Mount Rundle and Sulphur Mountain. 3/ It needs to be pretty cold, which is not usually a problem when the first two conditions are met in late December each year. 4/ It needs to be a mostly clear day with low atmospheric haze. This is usually not a proble at the end of December when the cold overnight temperatures usually freezes low level water vapour out of the atmosphere. Where is the best place to photograph The Rundle Diamond? There are a number of luke warm water sulphur springs along the lake shore of each of the three Vermillion lakes that collectively make up “The Vermillion Lakes.” They are located pretty close to the town of Banff too, about 1 km to the first lake, and about 4 km to the end of the third lake. 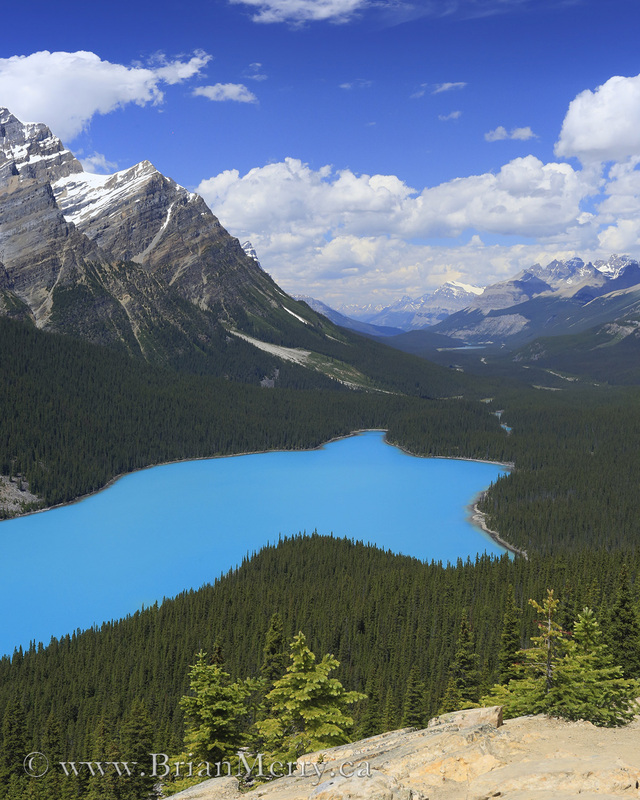 The Lakes are accessed via the aptly named “Vermillion Lakes Road” which is located about 500m from the town of Banff. Vermillion Lakes road is accessed via a West turn off of the Mount Norquay Road. This turn is very close, about 50m, from the West exit to Banff off of the Trans Canada Highway. Once on the Vermillion Lakes Road, continue down it driving past the first lake. Soon after passing the first lake you will come to Second Vermillion Lake. There is no street sign beside the lake identifying it as Second Vermillion Lake. So, just make a mental note that you have to stop at the second lake. I wish you the very best in capturing your own version of this Famous Photograph. And if you would like me to help you photograph it, and then help you to photograph many more of the Famous landscape Photographs that Banff and Lake Louise are Famous for, please consider hiring me for a private landscape photography tour. I’ve been leading private tours here in the Canadian Rockies for more that 20 years. I will be able to help you to capture your own World Class landscape photographs of the Canadian Rockies. I had an interesting grizzly bear encounter on Thursday, June 27, 2018. My wife, Kazue, and I were backcountry camping at Norman Lake near Sunset Pass in Banff National Park. Norman Lake is a little South of the Columbia Icefields and a few KMs East of the Icefields Parkway. It was a nice day in late June in 2018. Suddenly, as we were finishing up dinner not one, but two grizzly bears appeared in the mountain meadow in front of us about 150m away and began walking straight towards our campsite. And, the distance between us was closing uncomfortable fast. are walking towards you and they haven’t seen you yet? You yell at the Grizzly Bears, of course! I walked out from the edge of the trees where our campsite was so the pair of approaching grizzly bears could clearly see me and I started yelling at them. The big one stood up to investigate. That was a BIG Grizzly Bear! He was BIG! Probably 7 to 9+ feet high. He was a really big boy! The other grizzly was a little smaller, but it was a big bear too. 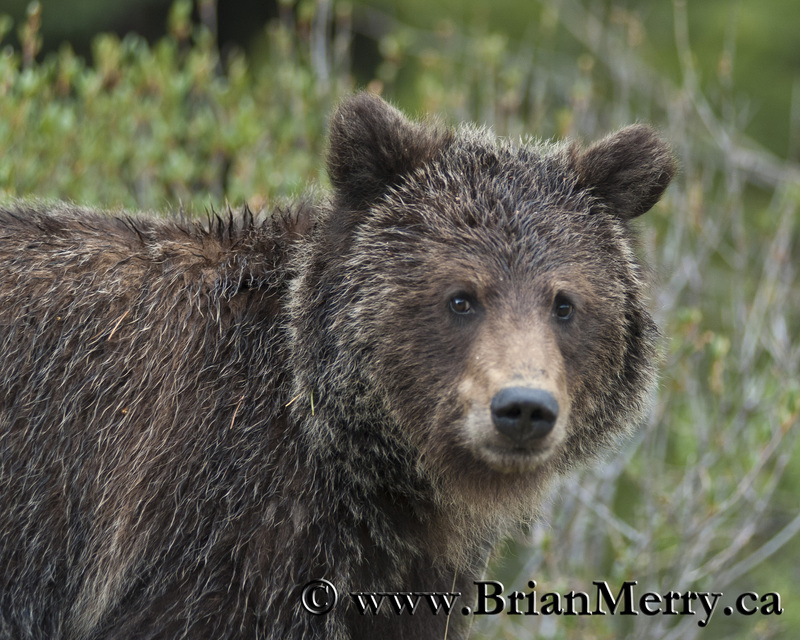 The smaller grizzly bear was probably a female since Spring is breeding season for grizzlies in the Canadian Rockies. After seeing the larger bear stand up, the slightly smaller bear took off sprinting to exit the meadow to the left. She didn’t want to have anything to do with us. When the big grizzly saw her leave he decided that he had better follow her too and he took off after her at full speed. Man, grizzly bears can run really fast when they want too. I estimate they were running at least 3-4 times faster than I can run. Did I Manage to get a Wildlife Photograph of the Advancing Pair of Grizzly Bears? Luckily the bears were good grizzly bears. They didn’t really want to have anything to do with us either, and took off once they noticed that we were already in the clump of trees that they were heading directly towards. That’s another crisis averted in the backcountry. I apologize for not having a photo of the big grizzly standing up on his hind legs to take a good look at us. That was a very impressive sight to see. But, I was completely focused on managing the situation and didn’t even think about taking a photograph. The photographs of the bears I’ve included in this post are different bears that I photographed in previous years. 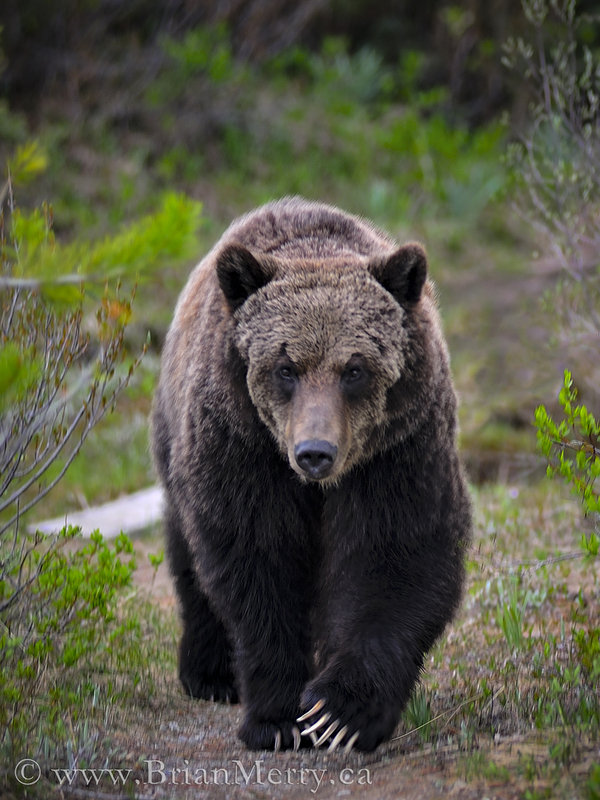 The lead photograph in this post features another big bear that I encountered in Jasper about five years ago. The bear I saw last Thursday was larger than the bear in the photograph. Living in Banff makes me feel so alive! After the encounter I simply went back to drinking my apres supper coffee and chilled out by our campfire. The tense situation was over as quickly as it had developed. The bears now knew where we were and I was fairly confident that they weren’t going to come over to investigate our campsite any farther. I revealed myself to these two bears because I really didn’t have a safer escape route or an avoidance alternative. 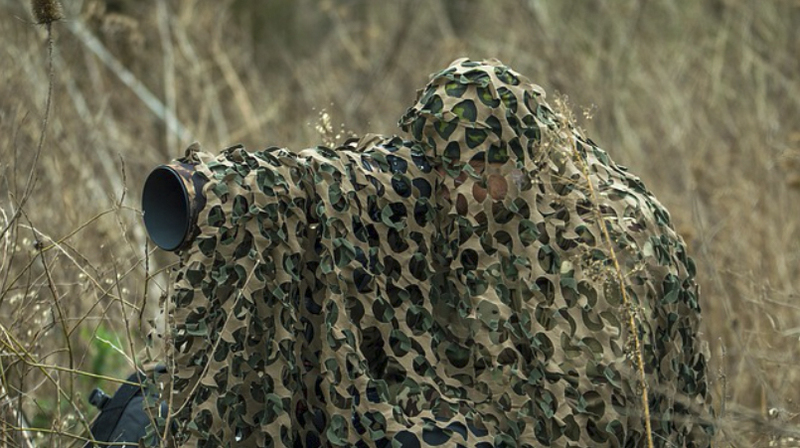 I’m definitely not recommending that people should go out looking for bears to challenge. That would be, well, stupid. And, that practice will probably end badly eventually. I’ll say again that I confronted these two bears because I didn’t have another viable escape or avoidance option. Letting these two grizzly bears know that I was in their path was my best option to avoid a more dangerous encounter. And, it worked. I’m convinced that bears don’t want to hurt people, for the most part! Enjoy the Canadian Rockies. They are beautiful. Summer is my Slow Season for Photography Tours – But Why? Most people think that Summer in the heart of the Canadian Rockies, where I base my landscape photography tour business, would be absolutely hopping busy in the Summer. And, it is. But, for a small landscape photography tour operator, like me, it’s actually a little slow. I think that the reason is that small group and independent travelling outdoor photographers tend not to visit during the Summer months. But, why is that? And therein lies the problem. Outdoor photographers and millions of other travellers from around the World want to come to the Rockies to feel, and photograph, the spiritually inspiring landscapes. And by default, the big tour companies end up buying up most of the accommodations. What ends up happening here in Banff and Jasper is that the big tour companies book most of the available accommodations 6-9 months in advance, or more. This leaves few hotel rooms for the small Family and independent travellers to book. But, all is not lost. Plan Early, and book a year in advance to beat the big tour companies annual planning meetings and subsequent room blocks. This does involve a little bit of a commitment on your part You need to plan this year for next year’s vacation. There’s no spontaneity in that! But, if you decide that you’d like to visit the Canadian Rockies, and you should because it’s one of the most Naturally beautiful places in the World, you should plan right now for next year. That is, plan your 2019 summer vacation in Summer 2018. Or… Call up a day or two before you want to arrive. Often guests will cancel room reservations a few days before they are due to arrive. Tour companies also release a few rooms as well because their numbers have decreased on short notice. If you’re persistent in checking for vacancies then you’ll usually find a room for a few nights. Be relentless! Employing this strategy will pretty well guarantee that you’ll find hotel accommodations in Banff, Canmore and in Jasper. Sometime you can find accommodations 4-6 months in advance, but, the selection for hotels will be decreased. Plan your trip early for the best selection at reasonable prices! Why am I writing this helpful post? Well, I’m writing this post for you, the small independent travelling photographer, because you are my customer. You’ve helped me to earn a living over the years and to eventually to buy my own own home here in the Town of Banff. And, I want to help you to see and photograph one of the beautiful places in the World, my home, the Canadian Rockies! In short you are the reason why my outdoor photography business has become successful. I’m able to make a living when many of you book my private landscape photography tours or one of my other travel photography tours Worldwide. And, to return the favour, I want to help you to be successful in planning your own landscape photography trip to the Canadian Rockies. Where are the best Photo locations in the Rockies? Yeah, I know you want to know this! And I tell you in my blog. If you’re researching the potential for wildlife and landscape photography in the Canadian Rockies then please google my name along with the places that you want to photograph. I have a ton of “location profile” blog posts describing the iconic landscape photography locations in the Canadian Rockies. And, I tell you how and when to shoot them too. A few times of the year I write detailed landscape photography location profile explaining how and when to photograph the Famous locations Banff and the Canadian Rockies are known for. You should check ’em out. I truly want to help you to have an amazing outdoor photography trip to my home in the incredible Canadian Rockies. Are you pressed for time when you’re here? Do you want to, or do you need to maximize your landscape photography in the Rockies? If you do, then consider hiring me for a private landscape photography tour. I’ll show you all of the best locations given the weather that we’ll have on your tour. And, I’ll give you lots of tips during on our tour to help you during the rest of your trip. Bring a map. I’ll circle some hotspots on it that you should photograph throughout the Rockies. Explore my blog and trip advisor to start researching your trip to the Canadian Rockies today. I want to help you to succeed! I hope to see you here in the near Future! What is the “Ask Brian…” Question and Answer Blog Series? Ask me a question! Submit your questions to me answer about once a month! In this “Ask Brian…” blog series I’m going to be answering your questions about landscape and wildlife photography. I’m not going to be picking what question to ask, you are! Oh boy. I think I’m in for one heck of a ride! I’ve been a professional outdoor photographer since 1997 traveling around the World for photography. I’m also the President of the International Landscape Photographers association hosting an annual conference on Landscape photography each year called The ILPA Summit. I feel that I’ve learned a few things worth sharing. In the decades that I’ve been in the industry I’ve seen a lot of changes. I’ve been fortunate enough to have the foresight to frequently see change coming. I’ve learned a lot during my career. And I still have a lot to learn too! 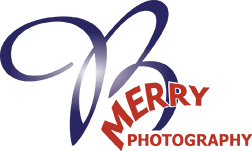 But, now I want to share what I know with the amazing outdoor photography community that has given me my 2+ decade career, and counting… I want to give back to the community. Please submit your questions to me via the contact form on this website. I’ll take the time to answer the questions that I think will help the most people. I should warn you ahead of time though that I’m probably not going to have enough time to answer everybody’s questions. But, I am going to do my best to answer as many as possible. If I miss anybody I want to apologize to you in advance. 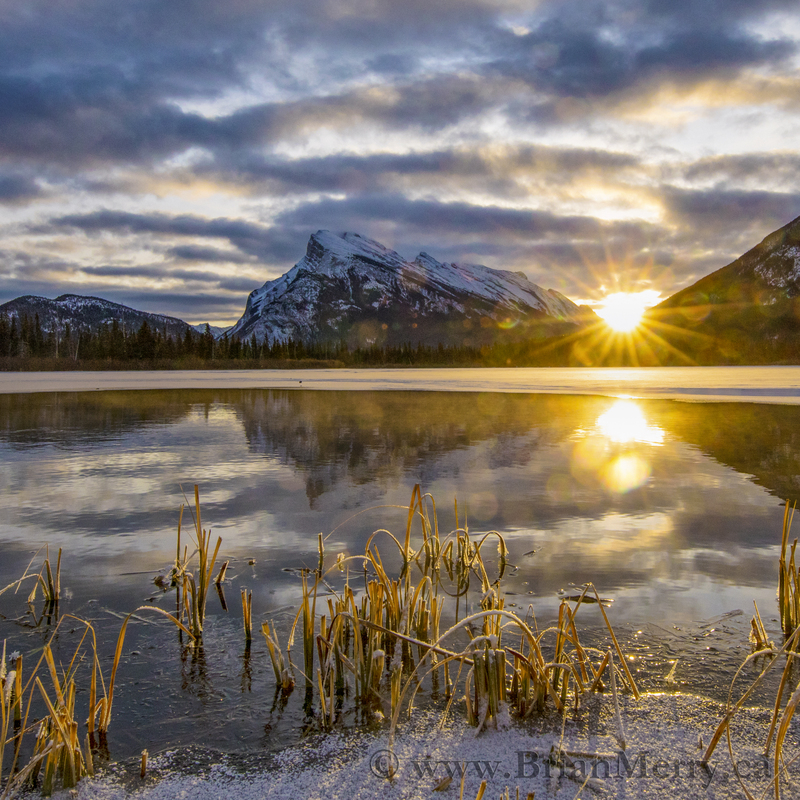 The Banff National Park Landscape Photography Day Tour, June 3, 2018 Edition is Almost Sold OUT! 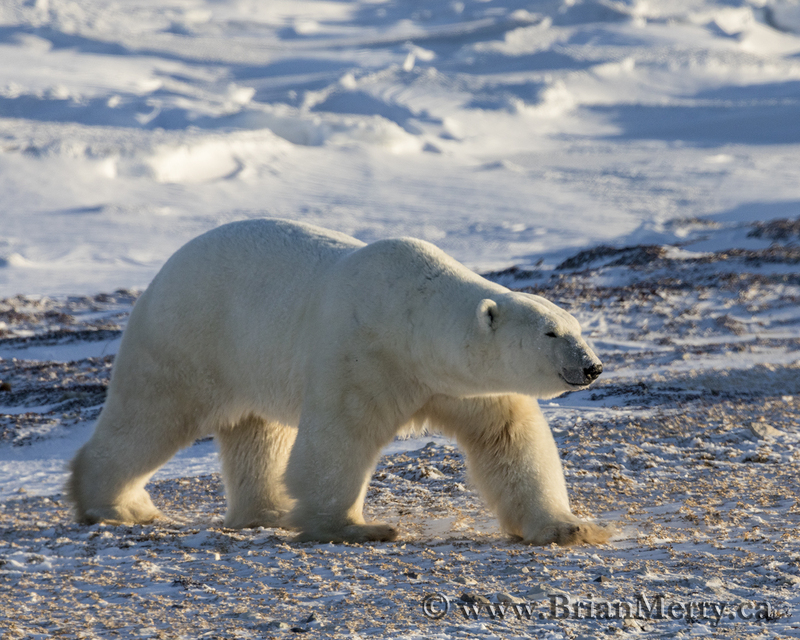 Last Fall I was graciously given the opportunity to help lead the Polar Bear Photography Specialty tours in Churchill, Manitoba for Frontiers North Adventures. It was a great a experience. 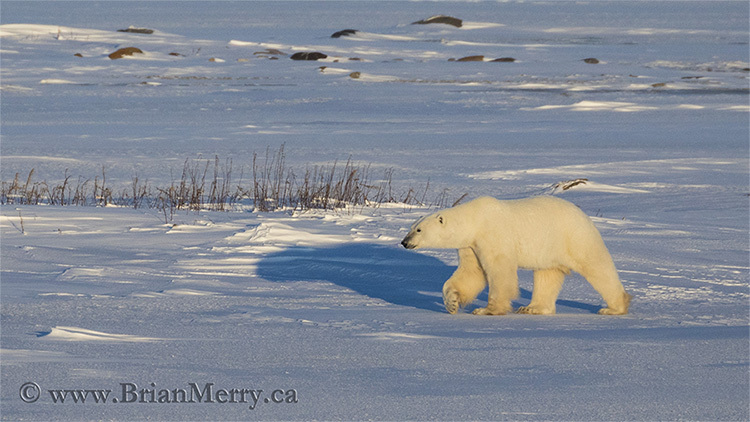 I’m grateful for the opportunity to photograph about 60 beautiful polar bears in about 130 different encounters. They are so beautiful and curious. I dare say that they are even cute. But that cuteness is only my own anthropomorphic impression. Polar bears would happily have me for lunch if they were given the opportunity. I photographed this particular individual early in early November 2017. He was quite a beautiful bear and I remember this particular session very well. I had been up in Churchill for a few weeks already and I had already photographed dozens of bears. I started to think about what I could do to fill up my “hit list” of Polar Bear Wildlife Photography images. One of the iconic photos that I decided that I wanted to capture was two polar bears sparing, aka “the dance of the polar bears.” Polar bears sometimes spar, or box each other to establish and reenforce their dominance. I wanted capture “the dance of the polar bears” at Sunset. Sunset at this high latitude lights up the landscape and is composed of a yellowish orange light. That would help to create a beautiful photograph. But, time was running out. I had a limited amount of time to photograph polar bears last Fall. I was feeling that time was running out for me to get “the shot.” After all, I was flying back to my home in Banff in a week after being on the road hosting and leading photography tours across the country for nearly two months. Fall is a busy time for me. But, luck was moving in my direction. As this beautiful bear walked across the frozen tundra pond above I knew that I was witnessing a beautiful scene. I had my shutter speed set high to avoid camera shake and my “image stabilization” turned off to maximize my chances for a sharp image. In this photograph I wanted to communicate the feeling of the cool isolation and the hungry patience of these bears. I wanted to communicate the lonely isolation in the beautiful landscape in this photograph. This is why I choose to crop it 16:9 to accentuate the lonely journey of this bear. However, just out of the frame in this photograph is another bear. After a while they met and stood up to spar for a moment. And, I got some shots as they sparred with each other for a few seconds. But, the Sunset light had past and I got them sparing in cool blue hour light instead. I didn’t get the exact photograph that I was looking for so, I guess I’ll just have to go back! If you’d like to learn more about the plight of Polar bears and what populations are doing well, and what ones are threatened, then explore the Polar Bears International, PBI, website. PBI is the public outreach group researching polar bears and the challenges that the species faces moving forward . Learn from the scientists! Marble Canyon is an easy objective to photograph in both the Summer and in the Winter. Visit this location on a heavy overcast or snowy or rainy day. However, this little gem of a landscape photography location is often overlooked landscape photography even though it right next door to Banff National Park in the Canadian Rockies. I can understand why it gets overlooked though. Banff and Lake Louise are it’s World Famous next door neighbors. If Marble Canyon wasn’t a 10 minute detour from the drive between Banff and lake Louise it would be an extremely popular destination. While standing on the first bridge above the water about 3 meters below a photographer can shoot up the canyon to create a nice composition. The brilliantly turquoise blue water is flowing softly out of the canyon at this point. This first bridge is only about 75 meters from the parking lot and the trail drops about 4 or 5 meters as you walk there from your car. Looking up river from the third bridge is about the deepest part of the Canyon. Shoot this location on a heavy overcast or rainy day as previously mentioned. This shot doesn’t really work on a bright sunny day because of the strong highlights and shadows created in the deep canyon. There is about 8-9 stops of variation in dynamic range at this location on a bright and sunny Summer day. This is where the ice climbs form almost each Winter and the frozen waterfalls are the highlight of the canyon in the Winter. The photograph below was taken on the fifth bridge looking upstream and angling the camera nearly straight down. And, the photograph at the end of this post was taken at the bottom of the Canyon at the base of the frozen waterfalls when yours truly was leading an ice climb out of the canyon. Yep I sure do love ice climbing! From January to Mid-March there are ice climbers here most afternoons when the frozen waterfall forms. At the time I wrote this post in March of 2018, the Ice climbs were not formed. Me had an extremely dry Summer last year which probably the reason the frozen icefalls didn’t form this year. And, they won’t form this late in the season either. Let’s hope for a normal or wet summer in 2018 so the ice can form in the Winter of 2018-19! 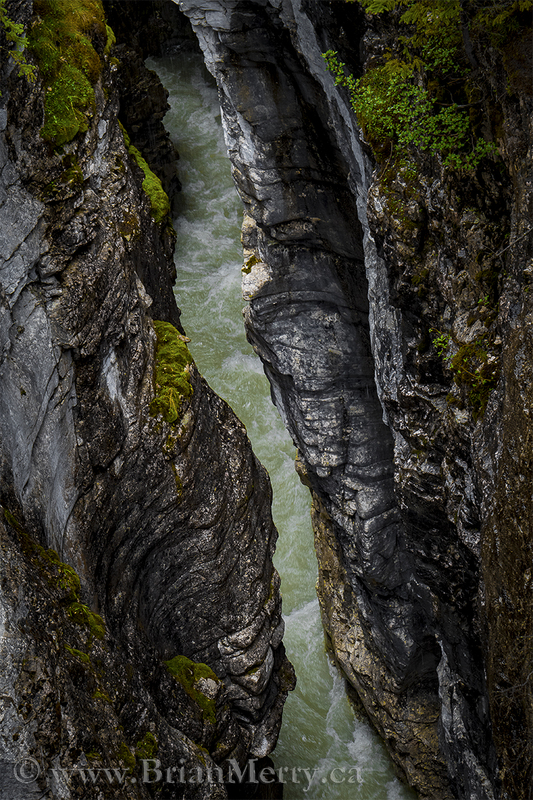 Marble Canyon is just a 40 minute drive from either Lake Louise or Banff. It is a good destination to include during your photography vacation to Canadian Rockies. But, if you are pressed for time it would be OK to consider cutting this location out. Visiting here will take about 3-4 hours return from either Banff or from Lake Louise. It’s worth the visit if you can fit it in. Have fun in the Rockies! 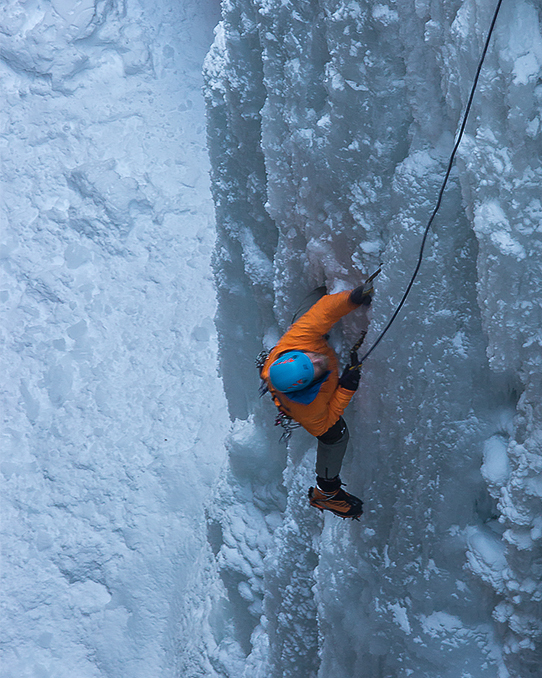 Ice Climbing out of Marble Canyon in Winter. 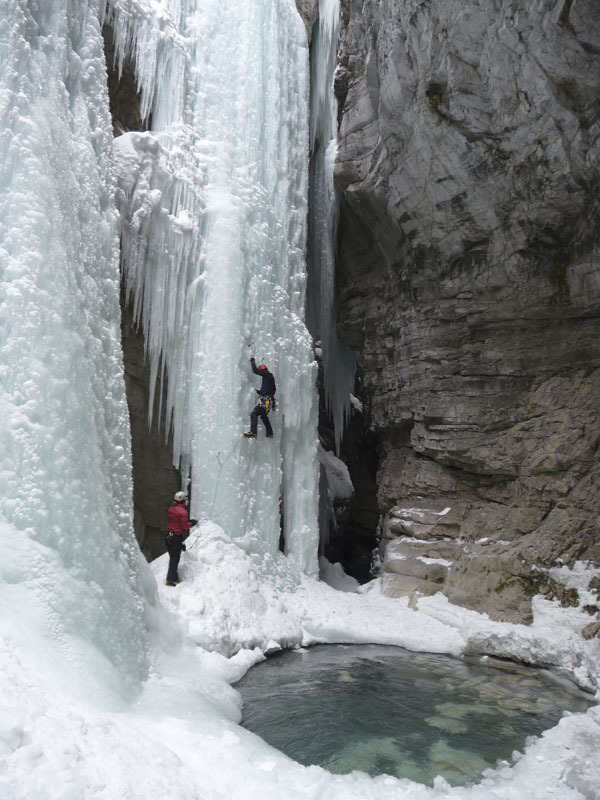 This ice climb that rarely forms is called Swine Dive, 35m, WI 5+. The bottom of Tokkum Pole is also seen in the left foreground. Ice climbing and rappelling skills are required to get down to this location, and to then get back out again. Access to this location is not possible by walking. Climber – Brian Merry : Belayer; Megan Beaumont. Photography workshops are great to help you to find new ways to photographically express yourself. I try to tak one somewhere in the World every couple of years. Usually I take a workshop from a leading photographer who I think has some teaching ability. That last point is an important one. Not all leading photographers with huge social media followings have a teaching background and can teach. So, I do my research before committing to a workshop. A great workshop close to my home in Banff! A few years ago I saw that a local photographer in the Canadian Rockies was hosting a weekend workshop at his home. Kristian Bogner was teaching one of his “Photographic Rock Star” workshops. He’s a Nikon ambassador so I attended even though I’m primarily a landscape photographer. A venue in someone’s home is not usually something that I go for. But, the registration wasn’t expensive at just under $1000 CDN for the 2 day, 14 hour event, so I took a chance and went. I think it’s a good to develop completely as a photographer so I have lots of different skills to choose from when I set out to express myself. I thought that I would be able to learn something from him. And, I did. I tipped my head and looked down at my knees for a bit while doing my best to calm myself. I opened up emotionally and practiced a bit of internal reflection. My thoughts defaulted to the technical side of photography at first. 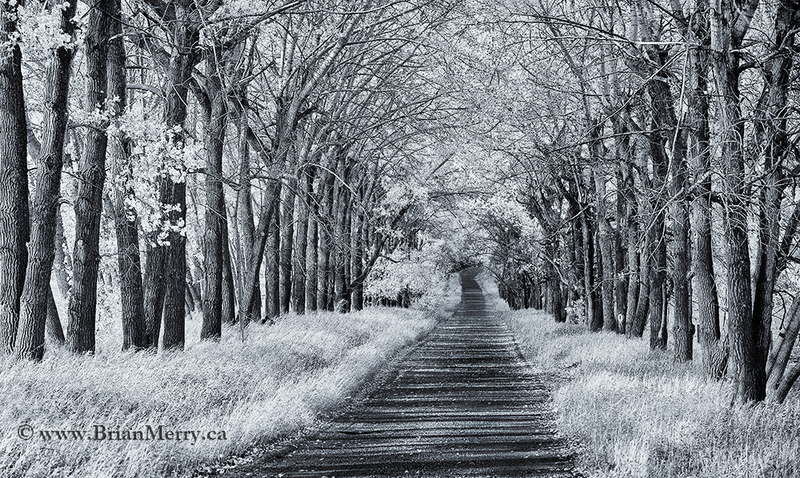 Way back in 1989 I started in landscape photography as a serious amateur, and haven’t really looked back since. I remembered struggling through the years of trial and error experiments. Learning the fundamentals of the exposure triangle, flash photography and refining my technical skill helped me to become a better photographer, technically. I thought about the 3 core filters for landscape photography that I used then, the circular polarizer and a 2 and 3 stop graduated neutral density filter. But, these didn’t give me an answer to his question either. I thought about the colour intensifying filters like the sign-ray golden’ blue polarizer and the cokin blue/yellow polarizer. But the camera gear that I owned and used couldn’t provide me with a complete answer to his question. Is editing the path to Photographic Excellence? I thought about HDR and my raw workflow through Adobe Lightroom and Photoshop. I thought about working my way up in lens quality to the professional core collection that I now carry standard in my backpack. I’ve also added a few other key speciality lens, two full frame camera bodies and a pro cropped sensor body to round out my pro kit. Briefly considering my editing workflow gave me a bit of insight into my answer to his inquisitive question. I thought about the in camera editing that I do before I shoot with Canon’s custom picture styles. Then I thought about my workflow to import the images and then how I edited them using a somewhat standard workflow. I pay close attention to contrast control and colour theory as I work through my editing process in an effort to send a clear emotional message through my photographs to my viewers. After a while I could feel my emotional perception broadening. I felt the muscles in my face relaxing. I began to open up emotionally and dreamt about how I truly felt about his question. Then it came to me like I’d known the answer for years but never before consciously realized it. Emotional communication was the answer to obtaining photographic excellence. For me, photographic excellence means becoming fluent with the connection between the technical aspects of photography and our deep emotional reaction to all beautiful things so that pure, raw emotion can be captured in the camera, cared for in the editing process and communicated through the photograph later with ease to the viewer as a pure and uninterrupted extension of our personal expression through pure emotional communication. For me, this is photographic excellence and this is what I set out to do every time I pick up the camera, teach a workshop or lead a tour.